Probably, you did not have enough vehicle addons for Minecraft PE but we will fix it. 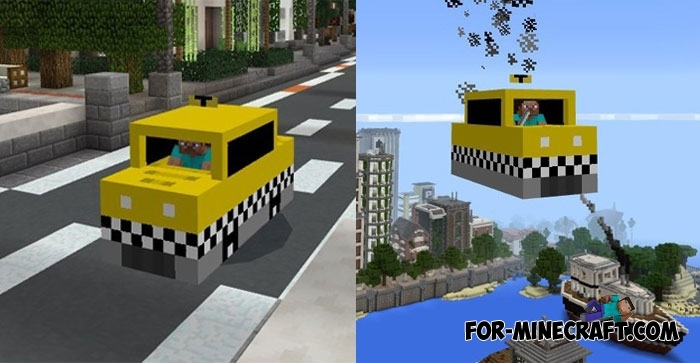 Surprisingly, the Mine-Taxi Addon adds two types of taxis, but the cars do not differ in appearance. The difference is that the first type of taxi rides on the roads like a normal car but the second type can fly! Both cars have the same speed and model and are suitable for everyday driving around the world. There are some popular copies of cities where you can drive any of these cars. UKS City (click to download) has an extensive network of roads for high-speed trips as well as steep turns. How to drive the cars? A flying taxi requires bottles o’ enchanting as fuel. The more you throw the bottles the higher your car flies. Take more fuel to fly as much as possible. When the fuel is fully consumed, the car will slowly fall to the ground. If you do not want this then drive an ordinary taxi. The standard taxi moves only with a key which can be taken from the creative inventory or get through the Toolbox for MCPE. In the end I would like to say that this is not the first Minecraft PE addon that adds a car. Use the search on our website and you will find many different cars. Start the game and activate these files (behavior and resource pack).